Keep at the goals, resolutions and dreams you made at the start of 2016. Remind yourself of the reward if you achieve success! 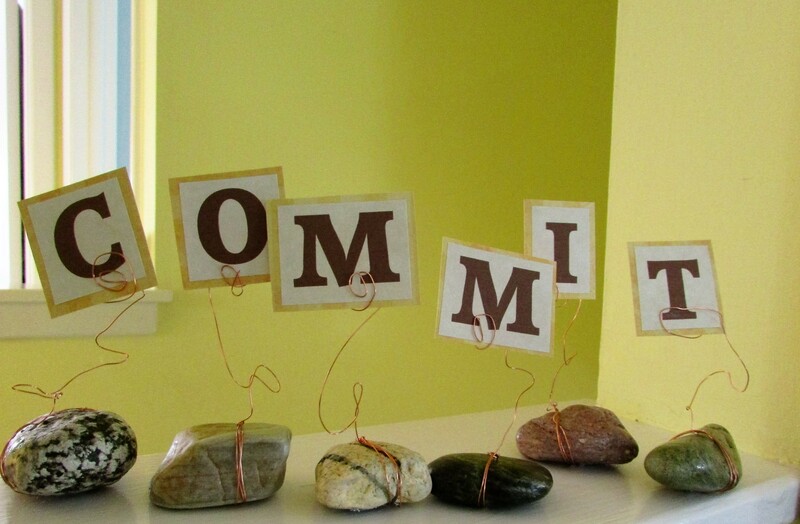 These rocks collected on the beaches of Block Island, Rhode Island, were the perfect base/weights to hold my winter theme word letters, “COMMIT.” They are a good reminder to me to take a few steps towards my goals each day. Nice reminder and thank you for reminding me. The rocks are good and above all, the idea of sort of engraving your commitment on stone, great. Thanks Susie…a reminder with a bit of fun involved. Have the happiest of days my friend. This year instead of making a meaningless resolutions that I’m sure I would not keep, I’ve been challenge to a One Word resolution to keep and pray daily as a way of celebrating my new year. This One Word will be my mantra for 2016. An Anchor to secure my life in the up and downs that may occur, but I will stand firm and secure in the knowledge that I will not be alone.